Regular readers will recognise Stoner the Bear, but I guess it’ll mainly be our American readers who will also recognise that shiny thing with knobs on. Yep, we’ve gone and bought ourselves a genuine (pronounced gen-yoo-ein) All American Pressure Canner, and it arrived at lunchtime today having left Wisconsin just three days ago. We long ago realised that nobody in Europe makes a decent pressure canner, so if we wanted one we’d be stuck with buying from the States via Amazon , but we always said we couldn’t justify paying the horrendous price for the real deal plus shipping. Having done all the research, though, we knew we wouldn’t be happy with anything less than an All American, so there the matter rested. Or it did until last week, when I finally said “Sod it, we’re only old once, so let’s buy the thing.” We’ve always worked on the principle that if in doubt, “oh what the hell” is always the right decision. So we bought one, and we’re well impressed with it even before we’ve used it. Can’t say we were impressed with the packaging, but against all the odds it did actually get here undamaged. Just. Verily, this thing is the Harley Davidson of pressure canners/cookers. Now, what Brit readers are wondering is why, when we’ve been successfully bottling fruit for years, do we now have need of a pressure canner? Well, the answer is the vegetables we grow. Without a pressure canner, we simply can’t bottle vegetables safely. Yes, we do have a freezer, but not one big enough to freeze what we want to grow for store. And besides, with bottled (canned) veg as well as fruit, we’re independent of the mains electric supply. That shot’s for the benefit of any UK readers who might wonder how many Kilner jars you can get in a 21.5 quart All American Pressure Canner. That’s six of the 2lb “Dual Purpose” ones, and it looks like 12 of the 1lb ones will work too. The instructions are comprehensive and typically American (and I don’t just mean all the references to quarts and bushels), although you are left wondering about “pole beans” and “string beans”. At the moment it seems to us that pole beans are runner beans and string beans are French beans, but if anybody knows for sure, do please add a comment now and clarify it for us! Cynthia is right…string beans have strings… and since there are bush/pole beans try to get the ones w/out strings… there are a few pole beans that don’t have strings…. Canning is wonderful! Oh, I’m also from the U.S. have been canning since the late 70’s… and my pressure canner is my friend!!! LoL…. if your interested in a spaghetti sauce recipe give me a note! Also have a great veggie soup that I’ve been canning forever! Just came upon your blog…. great! Thank you so much for sharing all your knowledge! 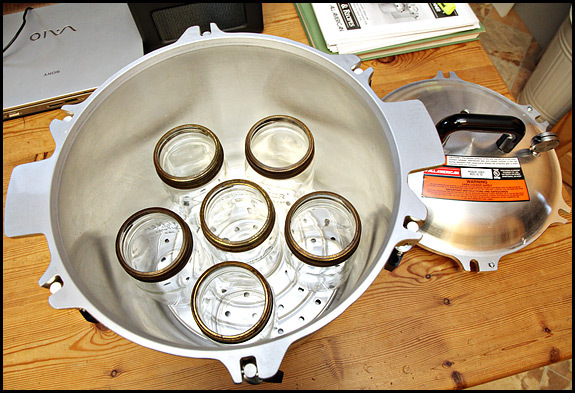 As long as the jars go into your canner straight… you can put all sorts in there. Mine holds 7 quart jars at a time and double the pints. Congrats on your cooker. It’s fab. Australian here, although living in the USA I have no clue on the beans. All I know is the ones which grow up poles are a devil to grow, but the bush beans grow like weeds in my neck of the woods. We can fruits and vegetables and such every year–you’ll love having the pressure cooker, it adds so much to the list of what you can do. Extra stew, chili, soup? Throw it in a bottle and pressure cook it. Now you have ready to eat soup on the shelf! We also can cut up potatoes, stew meat, carrots…have fun! Greeting from the good ole USA! Wonderful canner. Nice to see products imported from here. And I love my European made Singer sewing machine! Seeing the canner reminds me of all I accomplshed in the 1970’s–beans too. Even tried dilled beans, which were rather good. Enjoy. 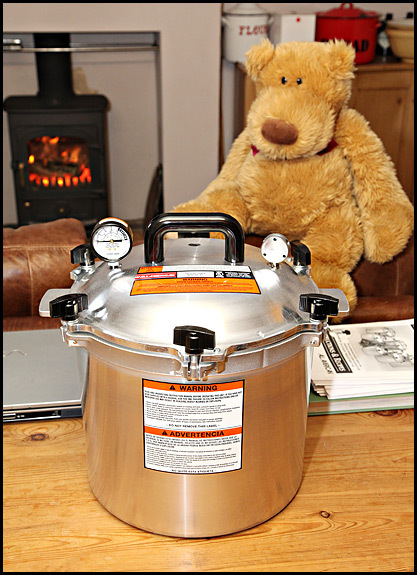 You’ll love your new pressure cooker, it makes canning very easy and safe. I’ve been using mine for over 30 years and I just get the pressure guage checked every year prior to the canning season. My mother had one of these, a little older than this one. I was always afraid of them and never used it. Please – now you must show us Willie! Meanwhile, string beans are those that have a string running from the stem to the blossom end, which is inedible – therefore we pull the strings (prior to cooking) by breaking each end and pulling toward the other end. Pole beans are those that climb, while their “opposites” would be “bush” beans, which don’t require as much support – they grow in a bush-like fashion. I’ve just begun canning myself (well, not me in a can – you know what I mean). Happy canning!